At Saints-n-Scissors, we specialize in innovative hair color techniques, hair cutting styles, color correction, the newest nail trends and organic skin care facials. We each have a fierce dedication to the latest trends and styles, ensuring we will provide you — our amazing clients — with exactly what you desire! Growing up in the industry, Amy is now a master colorist, hair stylist and color educator, with more than 15 years of experience. Utilizing elite color lines, she specializes in crafting custom color, uniquely tailored to each client’s vision. Amy is an expert in ombré, balayage, fashion colors, corrective color techniques and hair cutting styles. 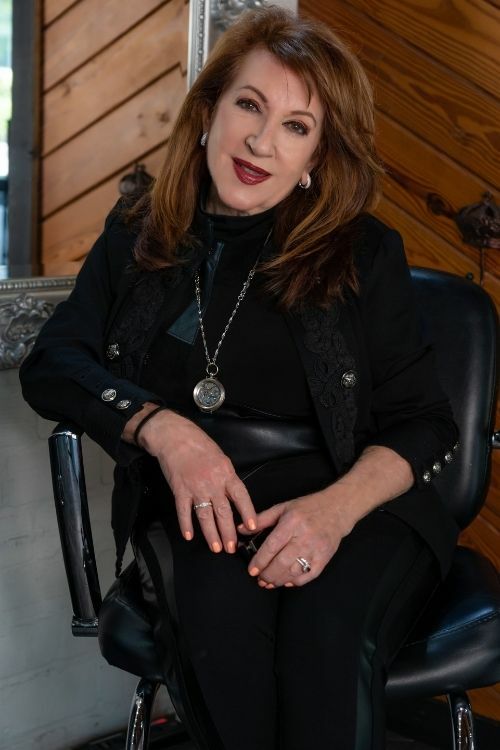 Shelley, a master stylist and colorist, started her career 35 years ago as a platform artist. She continues to use her experience, innovative techniques and knowledge to create innovative styles, tailored to each client’s individual desires. Her passion is working with each client to create their ideal image. Ricky, one of our veteran stylists, has been in the industry for more than 30 years. He was educated in New York City, and has fulfilled his passion in high-end hair color and cutting techniques. To this day, he enjoys keeping up on all the latest trends and styles. Bianca (AKA Bianca The Cutter) is a fourth generation hairstylist and has been in the industry for the past 10 years. A Paul Mitchell graduate, she has continued her education with them and other companies such as Toni & Guy, Wella, Andis and many more. A true hair artist extraordinaire, she develops your negatives to make you picture perfect. Licensed both in Florida and New York, Ameneh has been in the industry for more than 15 years. She trained in New York and worked side-by-side with Oribe, Edward Tricomi and other renowned hair and fashion industry artists. Her passion and focus remains in the artistry of her work, while always making clients look their best. Lauren has been a nail artist and esthetician for 13 years. Growing up artistic, she found her own creative outlet through nail art. Lauren specializes in natural nails and gel polish, with hand painting to suit your style. In addition, she practices organic skin care and waxing. Cristina has been a nail technician for 5 years. She specializes in natural and gel manicures, and spa pedicures. Her attention to detail stands out with every service. Licensed for more than 17 years in esthetics, Joey has worked with the best dermatologist in South Florida. She specializes in chemical peels, microdermabrasion, Hydrafacial, Micro-Needling and Radio Frequency. Her experience, combined with her bubbly personality, makes for a great facial and a good time! Kimberly is more than just our Receptionist; she is our Director of First Impressions! She is the friendly voice that greets you on the phone, books our appointments and knows how to deliver superb customer service by making each client feel like family in our salon. Please contact us to set up your free consultation, as prices below may vary. Making our clients happy is our top priority! Note that all services are non-refundable, but we will happily schedule a corrective service free of charge. We can’t wait to design the perfect look to suit your personality and lifestyle. It is our privilege to inform you about all the great styling options we have available.